With the slogan “History Lives Here,” Fairburn really takes people back in time. They have a historic downtown district with many buildings that are on the National Register of Historic Places. For lovers of the historic, Fairburn is also home to the annual Georgia Renaissance Festival. Like many other cities in metro Atlanta, Fairburn’s origin can be traced back to the railroads. In 1871, the city of Campbellton refused to let the Atlanta & West Point Railroad to pass through their town due to noise so it instead ran through Fairburn. As Fairburn grew, Campbellton faded away. 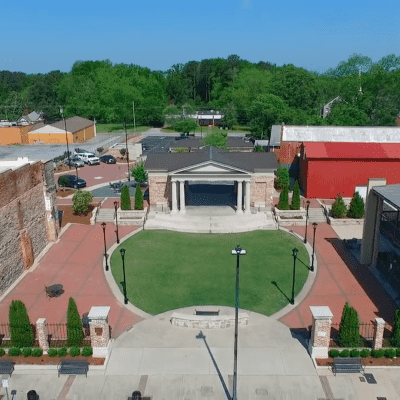 Located in Campbell County originally, the city of Fairburn suffered some rough times during the Great Depression. When the Campbell County government went bankrupt, the city was absorbed into Fulton County. The Georgia Renaissance Festival is a fair that takes place every year in the spring. Attended by almost a quarter of a million people each year, the Georgia Renaissance Festival has 10 stages featuring shows for all ages. Guests can enjoy a variety of 16th century-themed food, music, comedic storytelling, jugglers, and jousting. Many people attend the event in costume and they even have a pet-friendly weekend.